BinaryCent offers a reliable social trading portal which enables less experienced traders copy the trades of the experienced ones. Trades are executed instantly on the copy accounts. The user friendliness of the software interface also gets a high rating, which is why this performance metric is awarded a score of 85/100. 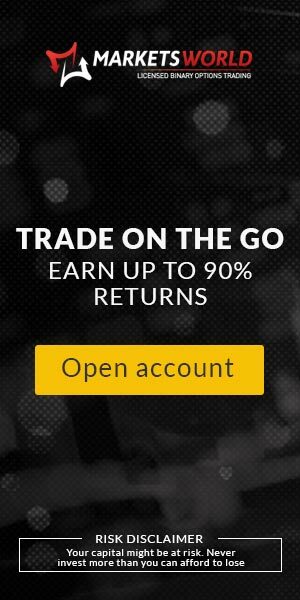 Traders are offered a deposit bonus on BinaryCent. Bonuses are offered as a percentage of the account deposit on a graduated scale. 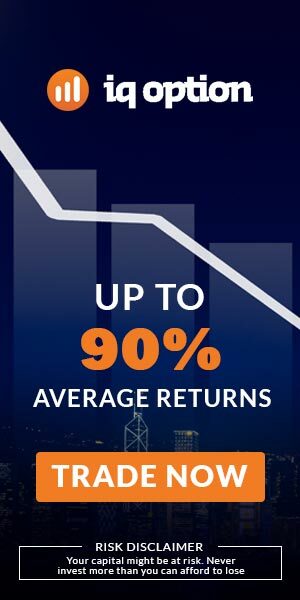 By awarding bonuses on the basis of trading experience of the clients, the rating for this metric is pegged at 85/100. Customer support on BinaryCent features a video chat, a phone service and an online contact form. This attracts a score of 70/100 on this metric. The BinaryCent platform won the Tech Finance Journal Award for 2015. BinaryCent is a relatively new binary options brokerage that decided to break away from the Monday to Friday trading schedule by offering assets that could be traded every single day of the week. Better still, traders can get quick access to their profits using the fast withdrawal system on BinaryCent. BinaryCent is a binary options brokerage firm founded in 2014. BinaryCent is the binary options brand of Finance Group Corporation. The product offering of BinaryCent is unique: the trading of cryptocurrencies as binary options assets. 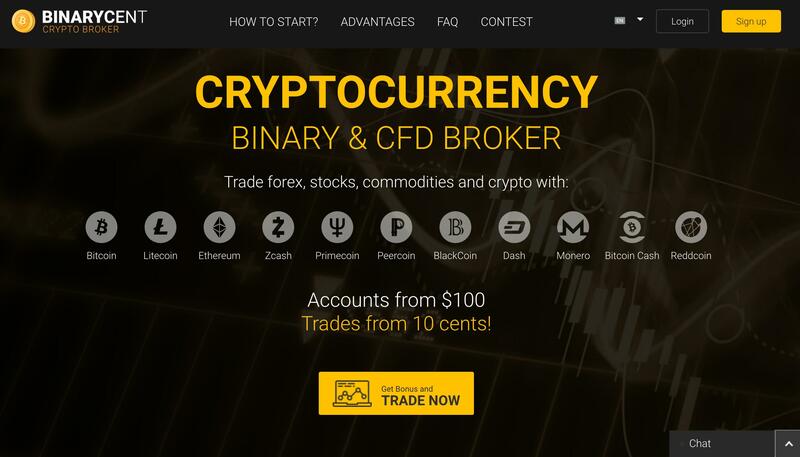 The trader has the option of trading these assets personally, or by choosing the copy trade option to follow the trades of other experienced traders. BinaryCent features a decent asset listing that is very unique because it only features cryptocurrencies. Cryptocurrencies traded include the following: Bitcoin, Litecoin, Peercoin, Zcash, Primecoin, Ethereum, Dash, etc. In all, there are about 20 listed cryptocurrencies. Gold account holders are given 100% bonus. All account holders are guaranteed withdrawals that take just 1 hour to process. Furthermore, traders can expect to gain a share of $20,000 prize money every week, which is allocated to 20 winners of the BinaryCent trading contest. You can download the mobile app from the respective app stores of Google and Apple. You can use the mobile version of the web-based platform. It has a pleasant UI and works just fine on hand-held devices. Credit/Debit Cards. With the Mastercard and VISA brand of credit or debit cards, it is possible to conduct deposits and withdrawals on the BinaryCent platform. This method attracts a 5% fee. Digital Wallets: Digital wallet methods that are allowed on BinaryCent include Skrill, Neteller and Perfect Money. YandexMoney, WebMoney and Qiwi are also featured here, and give traders all over Europe the opportunity to deposit and trade with digital currencies. Bank Wire Transfer. Traders can still use this time-tested and proven method of transferring money to and from the trading account on BinaryCent. Cryptocurrencies: Use Bitcoin, Etherem and other Altcoins to fund your account. BinaryCent provides multilingual customer support services around the clock. 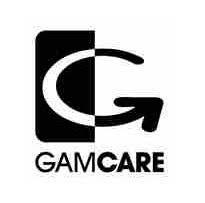 The customer support service is available either via phone, video chat as well as via an online support form. Video Chat is also available. This is a first in the binary options market where you actually get to see the customer support staff that you are dealing with. This provides a personal touch to customer service. An online support form can also be used to contact the team. This facility sends out information via email to the support team. The company offers video tutorials to help acquaint beginner traders with the basics of binary options trading. 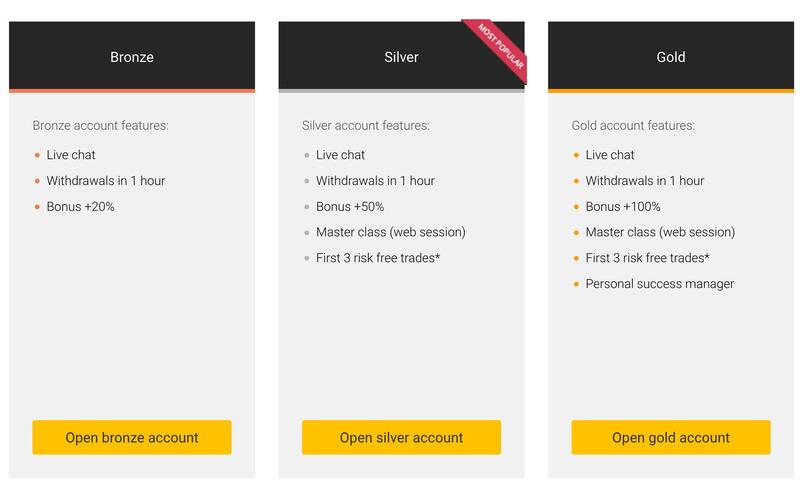 Silver and Master account holders receive master class web sessions aimed at providing them with further information about the markets. Guaranteed processing of withdrawals within 1 hour of request being made by the trader. Trading goes on non-stop, even on weekends. This is because cryptocurrency exchanges are open 24 hours a day, 7 days a week. Traders can transact using a wide range of deposit and withdrawal options. BinaryCent processes more than 10 000 transactions per day, which is a lot of work. This is done to ensure that there is no backlog of requests. The trading environment is secure with 100% data protection. BinaryCent has come up with a unique binary options model; the trading of cryptocurrency assets. This is unique because it guarantees that markets are traded every single day. With the way cryptocurrency assets are moving, there is enough volatility to present trading opportunities for all traders. However, BinaryCent has to address some situations on its platform if it is to compete with other brands that have stood out as the market leaders in the last 8 years. BinaryCent has a fast withdrawal process. Withdrawals are concluded in one hour. The trading platform is user-friendly and very responsive. The company offers multilingual customer support. BinaryCent has a social trading component to its product offering. Traders get a generous bonus offering. 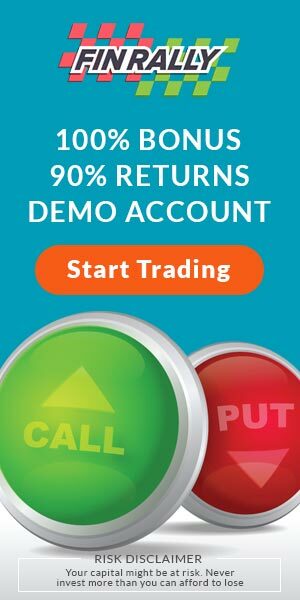 The firm lacks a full-featured, unlimited demo account. The customer support can be improved upon. What payment methods does BinaryCent support? BinaryCent supports several payment and withdrawal methods including cryptocurrencies, digital currencies (YandexMoney, Qiwi as well as credit/debit Cards (VISA, MasterCard). How fast are withdrawals processed on BinaryCent? BinaryCent processes withdrawals within an hour of the request being made by the trader. I am not an experienced trader. Is there a way I can copy experienced traders on BinaryCent? Yes, BinaryCent offers a social trading component to its binary options brokerage services. Details are found on the website. The lack of a regulatory license makes it difficult to know if BinaryCent is a scam or not. Presently, there have been no scam reports on the broker. However, BinaryCent needs to get a regulatory license to increase market confidence in its product offering.